Decware founder Steve Deckert proudly proclaims the Zen Torii is “the last amp you’ll ever want.” And if you agree with Nelson Pass’ theory that there is a best amplifier for each type of speaker, the Zen Torii could be just “the best” if you have the right speakers. 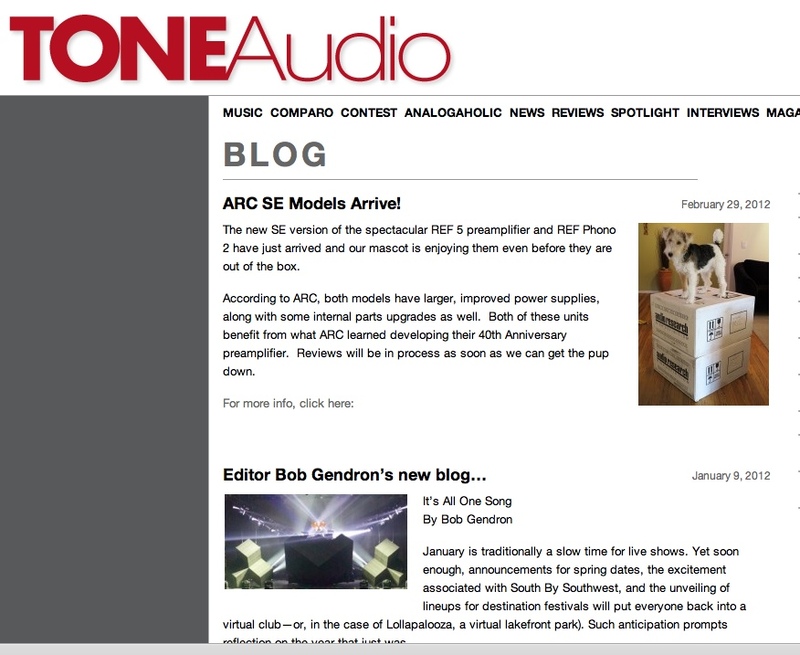 TONEAudio publisher Jeff Dorgay was smitten enough to purchase the Torii for his reference fleet of amplifiers. For an EL- 34-based amplifier, the bass grip is nothing short of breathtaking, and the Torii renders musical detail like Kodachrome 25. Indeed, there’s never been a better example of specs not telling the whole story. The Torii plays louder and interfaces with a much wider range of speakers than suggested by its modest 26-watt- per-channel rating. Showcasing old-school style, the Torii is hand-wired in Illinois by the DecWare staff and guaranteed for life. American craftsmanship at its finest. for life. Any way you look at it, offering long warranties takes guts. It also means you better make a damn good product, or you’re going to go broke servicing warranty repairs. 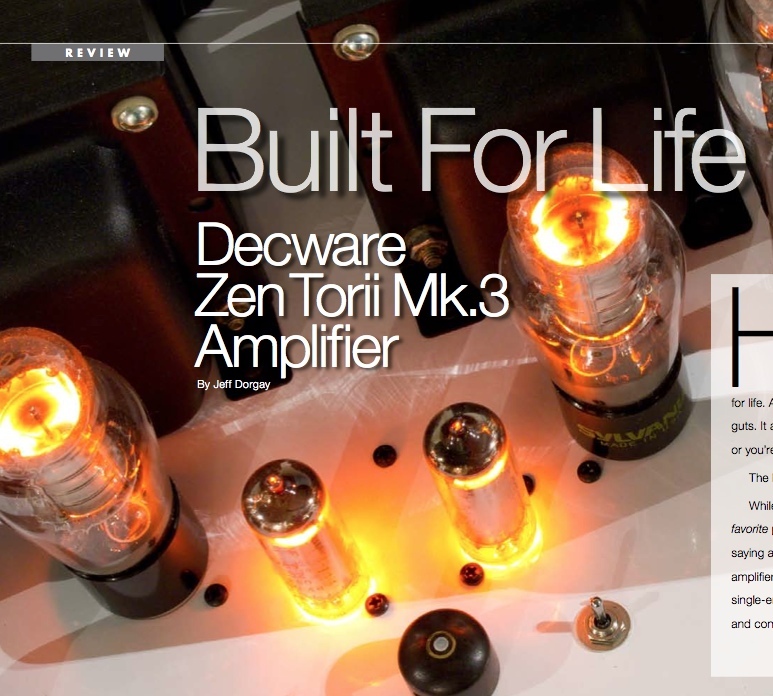 The Decware Zen Torii Mk.3 is a damn good amplifier. While I hate to use the “b” word (best), the Torii is my favorite power amplifier based on the EL-34 tube, and that’s saying a lot. I’ve always had a major affection for such amplifiers, which possess many characteristics of great single-ended triode amplifiers and yet, have more power and control than an SET can muster. 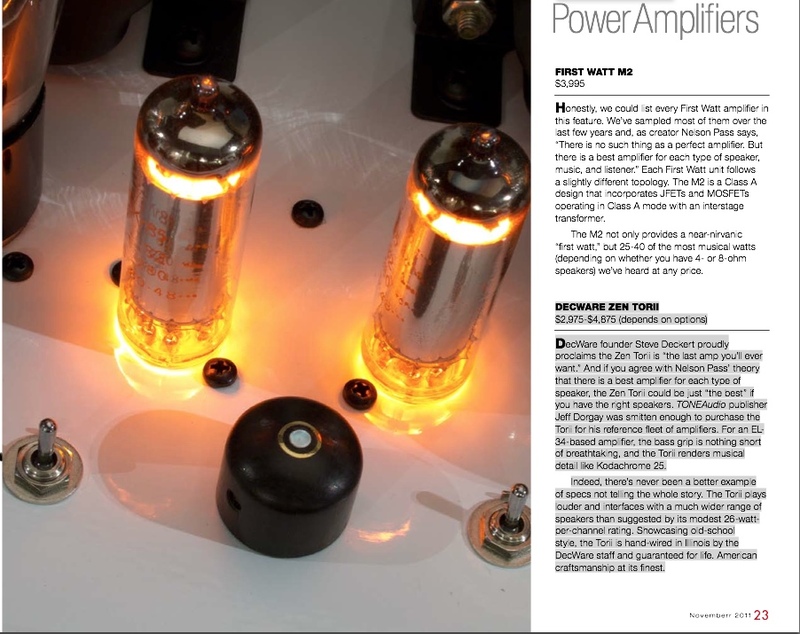 CNET – Can a 2-Watt Amp Sound Better Than a 200-Watt Amp? Americans love power. We buy 320-horsepower Chevy Tahoes to haul the kids to soccer practice. For home theater, the magic power number for receivers is 100 watts, and it has to be a seven-channel model, even though 80 or 90 percent of home theater buyers are perfectly happy with five-channel sound. Working Man’s Bible” presented excellent snap on Ferrone’s snare drum and cymbal spread was brilliant. The Sco disc reveled in a similarly large hall ambience.